The net caught so many fishes they could not pull it up. HEN JESUS BEGAN to teach the people by the river Jordan, a few young men came to him as followers, or disciples. Some of these men were Andrew and John, Peter and Philip and Nathanael. While Jesus was teaching near Jerusalem and in Samaria, these men stayed with Jesus; but when he came to Galilee, they went to their homes and work, for most of them were fishermen from the Sea of Galilee. "Put out into the deep water and let down your nets to catch some fish." 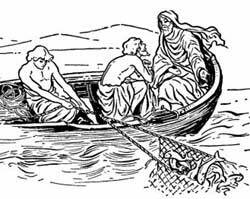 "Master," said Simon, "we have been fishing all night, and have caught nothing; but if it is your will, I will let down the net again." When Simon Peter saw this, he was struck with wonder, and felt that it was by the power of God. He fell down at the feet of Jesus, saying: "Oh Lord, I am full of sin, and am not worthy of all this! Leave me, O Lord." But Jesus said to Simon, and to the others, "Fear not; but follow me, and I will make you from this time fishers of men." On the Sabbath, after this, Jesus and his disciples went together to the synagogue, and spoke to the people. They listened to him and were surprised at his teaching; for while the scribes always repeated what other scribes had said before, Jesus never spoke of what the men of old time had taught, but spoke in his own name, and by his own power, saying, "I say unto you," as one who had the right to speak. Men felt that Jesus was speaking to them as the voice of God. "Let us alone, thou Jesus of Nazareth! What have we to do with thee? Hast thou come to destroy us? I know thee; and I know who thou art, the Holy one of God!" "Be still; and come out of this man!" Then wonder fell upon all the people. They were filled with fear, and said: "What mighty word is this? This man speaks even to the evil spirits, and they obey him!" After the meeting in the synagogue, Jesus went into the house where Simon Peter lived. There he saw lying upon a bed the mother of Simon's wife, who was very ill with a burning fever. He stood over her, and touched her hand. At once the fever left her; she rose up from her bed and waited upon them.